Growing up in the hardscrabble streets of Jamaica, Queens, Sherrilyn Ifill ’84 was raised in a family of 10 children. She describes her father, a Harlem social worker who hailed from Panama, as a “political junkie.” He soaked up the evening news and scoured the New York Post, New York Daily News, and Long Island Press—many of the same papers that cover the issues addressed by the NAACP Legal Defense Fund (LDF), where Ifill is president today. Ifill remembers watching the Montgomery civil rights protest on TV with her dad. She also recalls being 10 years old and reading a newspaper story about a young black boy who was shot by a New York City policeman. The police officer thought the boy had a gun, though it was proven that he didn’t. These moments left an indelible impression on Ifill and helped bolster her conviction that legal issues matter and play a role in improving everyone’s life. As the commencement speaker at New York University’s 2015 graduation ceremony, Ifill quoted Thomas Paine. “These are the times that try men’s souls,” she said as she compared recent civil rights struggles in Baltimore, Staten Island, Ferguson, and Charleston to those of the 1960s. The LDF “isn’t the first on the scene to decry the problem, but we’re second on the scene with an analysis of the problem and a way forward,” says Ifill, who serves as the spokesperson for the organization and regularly appears on CNN, NPR, and the PBS News Hour, and in the New York Times and Washington Post. “People count on us for a sober voice of reason and information,” she asserts. 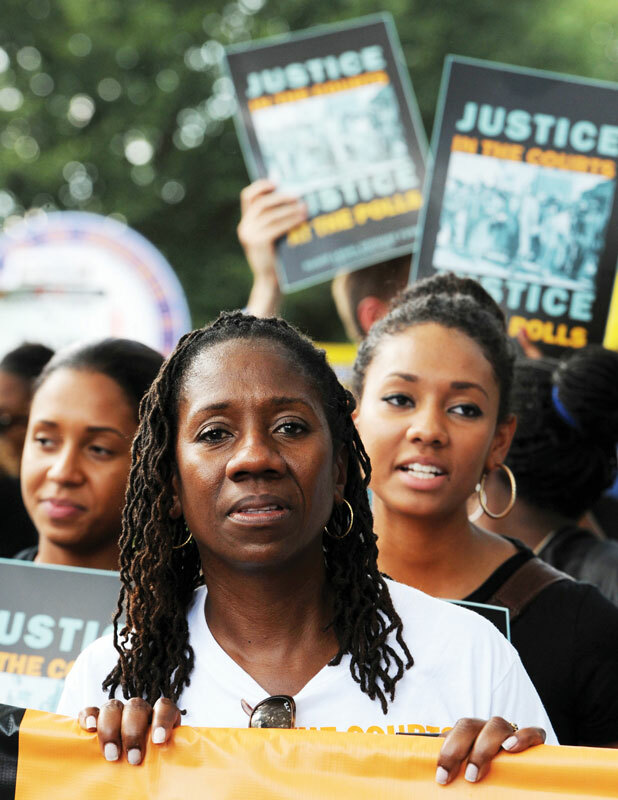 Sherrilyn Ifill '84 at a protest rally in DC. She credits Jamaica’s Hillcrest High School (full disclosure: this reporter was one of her English teachers) with setting her on the path to higher education. “The school was incredibly diverse. You could be really smart and find your level,” she recalls. It had black students (many from the Caribbean), as well as Latino, white, and immigrant students. At Vassar, she majored in English, which she noted was valued, not slighted, as it might have been at a college that specialized in producing accountants or business majors. Spending one semester in Spain not only broadened her global outlook, but also led to meeting her husband, who is German. They have three children. Attending NYU Law School was a perfect fit for Ifill. “It was filled with students interested in public interest law,” which mirrored her own values, she says. Her interest in civil rights law was beginning to percolate. After graduating from NYU Law, she worked for the American Civil Liberties Union and served as assistant counsel at the Legal Defense Fund. In 1993, she joined the faculty of the University of Maryland School of Law, where for the next 20 years she taught “Civil Procedure” and “Constitutional Law,” led civil rights seminars, and founded law clinics on environmental justice and the reentry of ex-offenders. This November, she was elected to the National Constitution Center’s Board of Trustees. She is the author of On the Courthouse Lawn: Confronting the Legacy of Lynching in the Twenty-First Century, which examines the lingering racial trauma resulting from the lynching of almost 5,000 African Americans between 1890 and 1960. Denial of these incidents and fear of reprisals after reporting them made squashing these heinous acts difficult. “You couldn’t find anything in newspapers. The silence was toxic,” she explains. 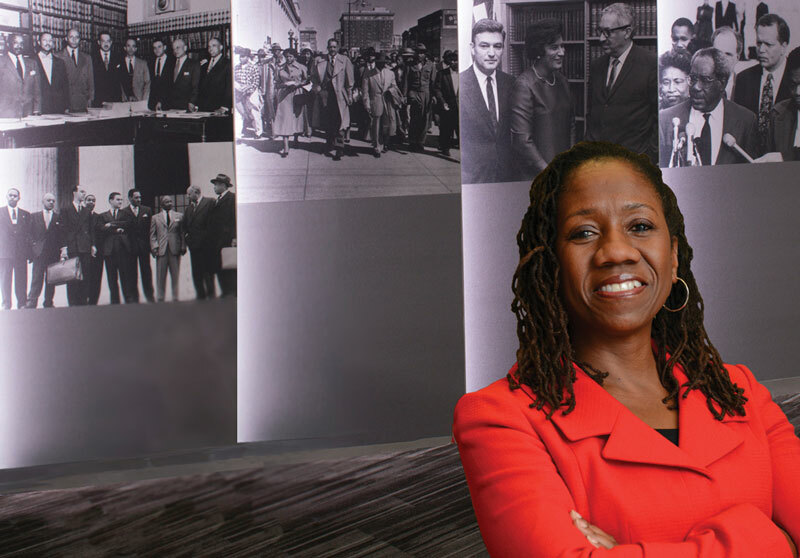 Since the LDF’s inception, major strides in civil rights have taken place, but Ifill is restless and knows that there’s much more to be accomplished. LDF has worked with the Department of Justice on police reform. Noting that police departments nationwide received $500 million in grants to support police training, LDF officials suggested that police reform emphasize deescalating violence, improving racial and gender diversity on the police force, finding specific ways to overcome racial bias, and the use of body cameras. Despite her many achievements, Ifill admits that she’s fallen short of what she inscribed in the Hillcrest High School yearbook: first black female Supreme Court Justice. But she’s fighting for the same civil rights that she would want a Supreme Court justice to uphold. “When so many of our nation’s schools are in such abysmal condition, when the economic prospects for millions of African American families are bleak, and when our housing segregation remains unabated across the country, the battle for equal rights endures,” she says. Law enforcement, Justice Department officials, and justice advocates (Sherrilyn Ifill) recently testified before a Senate judiciary subcommittee on the federal government's role in local policing practices and their impact on the ground. Watch now.